The World Space Expo (WSE) is a large-scale public outreach event happening at NASA’s Kennedy Space Center November 3-11, 2007. Celebrating 50 years of space exploration, WSE is an immersive experience of historic and modern exhibits, interactive presentations, rarely-seen demonstrations, and engaging general sessions with astronauts and industry personalities. Space exploration will act as the feature attraction to showcase Aeronautics, Space Operations, Exploration, Future Electronics and Earth & Life Sciences. 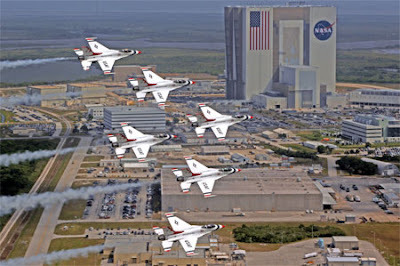 The first weekend of the Expo will feature the US Air Force Thunderbirds and the US Army Golden Knights in an aerial salute to NASA.